Wake up, your phone's ringing again." It was May 22, the peak of the fawning season, and the clock on my phone said 2:15 a.m. I got up and took the phone out to the kitchen, hoping my poor wife would be able to get back to sleep. The caller was Chris Shaw, my field crew leader, notifying me that another of our radio-collared does had given birth, the second that night. I'd just gotten back to sleep myself after returning from capturing fawns from the first one. I told Chris I'd be there in thirty minutes. We began studying fawns at the Savannah River Site in Aiken and Barnwell counties in 2006 in order to better understand what role predation by coyotes has played in the declines in deer populations, both locally and statewide, during the late 1990s and early 2000s. This was a cooperative research project between the U.S. Department of Agriculture Forest Service, who I am employed by, and the S.C. Department of Natural Resources. 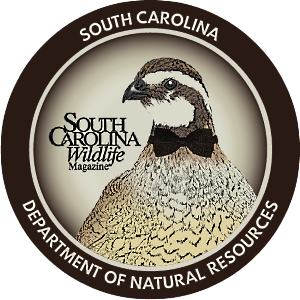 The DNR's involvement in the project was enabled by hunters' participation in South Carolina's antlerless deer tag programs. Coyotes very rarely take adult deer, but we know from studies of their diets that they do indeed consume fawns. Whether they ate enough fawns to make a difference in the deer population remained a mystery, but by attaching radio collars to fawns and monitoring them through their first few months of life, we hoped to learn what portion of fawns born each spring was succumbing to coyotes and whether this number alone was enough to explain declining deer numbers. The problem was finding fawns to radio-collar. Encountering the occasional fawn in the woods during spring is not uncommon, but we needed forty or fifty each year for several years. The solution - and the way Chris knew that this doe had given birth - was a new tool known as a vaginal implant transmitter, or VIT. These devices are implanted in the vaginal canal of pregnant does and expelled during birth, which triggers a temperature sensor on the VIT to change the pulse rate of the transmitter. In addition, the transmitter periodically emits a coded sequence of beeps that indicates how long it has been since the birth occurred, informing researchers of the precise age of the newborns. Chris had determined that this doe had given birth 4.5 hours ago, which would become 5.5 by the time we got to her. By tracking the radio signal to the VIT, we'd be able to locate and capture the fawns at or near the spot where they were born. 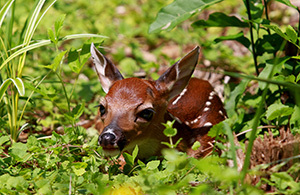 Before VITs, finding and catching enough newborn fawns in the dense underbrush of Southern forests for a statistically valid study was nearly impossible. We had caught the doe, along with thirty-seven others, while she was pregnant the previous winter, using a tranquilizer gun that shoots a dart equipped with a radio transmitter. 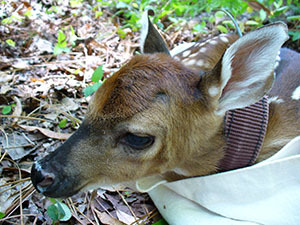 Once we recovered the anesthetized doe (sometimes itself no easy task), we equipped her with a radio-collar and a VIT. At the onset of fawning season (fawns are born between April and July, with the peak of the fawning season being mid-May to early June), we began checking the VITs of each of the thirty-eight does for birth mode every eight hours, around the clock, simply by getting close enough to them (about half a mile) to tune in the frequency of their VITs. Chris had also called in Mark Vukovich, our lead technician. At 3:05 a.m. we set out from the truck, headed toward the signal coming from the doe's collar, Mark in front guided by the telemetry equipment, Chris and I following, each scanning ahead with a thermal imaging scope. We tracked to the doe at first, rather than the VIT, on the chance that she had already moved the fawns from the birth site. Knowing her location before we disturbed her would give us a second point of reference in searching for the fawns. We walked into the woods off the back of an old clear cut and dropped down into a creek bottom. The closer we got to the deer, the more often Mark began to switch between the doe's collar frequency and the VIT frequency to determine if they were coming from the same location. We had gone about 250 yards when we reached the creek. Chris and I waited in the dark while Mark sorted out the signals, mosquitos humming around us in a dense cloud. On the opposite bank, switch cane and palmetto obstructed our view. "Sounds like she's near the birth site," Mark whispered. "We're close." Unable to find a spot to cross where the black water would not go over our knee boots, we stepped in, giving wide berth to a small cottonmouth coiled at the base of a cypress knee. As Mark stepped up the far bank, he paused for a moment, then turned back to us and indicated that he had just heard a deer moving away through the cane. Chris and I scanned the thicket with our scopes while Mark switched back to the VIT to see where it was, convinced now that what he had heard was the doe. After moving ahead about twenty yards, scanning as I went, I squatted down to scan under the waist-high vegetation with my scope, and there on the LCD screen appeared two white spots, the unmistakable heat signatures of two bedded fawns, curled up a few feet from each other, heads resting on their back legs. At this age, their defense was hiding and they would not attempt to run. I whistled Chris over and we began to work on the fawns. We blind-folded and weighed each fawn, both males, and slipped expandable break-away radio collars over their heads. After recording their GPS coordinates, we put the fawns back where we had found them and headed back toward the truck - 3:37 a.m., time for bed again. Over the coming days and weeks, my crew would check the collars of these fawns several times a day. Their transmitters contained a motion-sensitive switch that triggered a change in the pulse rate when the collar was immobile for four hours, indicating death. 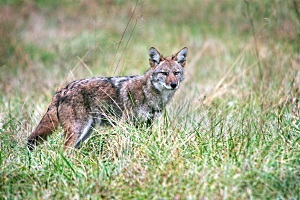 When a "mortality signal" was detected, they proceeded immediately to track to the collar (and therefore any remains), whereupon a thorough "CSI" (crime scene investigation) ensued to determine: a) whether predation was the cause of death, and b) if so, which predator was responsible - coyote or bobcat. We even collected saliva left on the carcass, from which we would later extract DNA to confirm the predator's identity. Over seven years of study, we tracked 216 fawns. We were shocked at what we learned. Fawns died from accidents such as vehicle collisions, drowning and getting stuck in deep mud. They were killed by bobcats. They died of illness and subsequent abandonment by their mother. One died from unexplained head trauma, and another may have been killed by fire ants. None were killed by wild pigs, despite their abundance in the area, or by dogs, which are extremely rare on SRS. Fawns died for a lot of reasons; the portion of fawns that survived until autumn averaged only 23 percent and varied little from year to year. But coyote predation was overwhelmingly the leading cause of death, accounting for 80 percent of all mortality. That translates to 62 percent of all fawns born, most of which would have survived had they not been taken by coyotes. During the 1980s and 90s, deer populations in South Carolina were booming. Even very high levels of doe harvest were insufficient to control numbers. But that trend began to change in the mid- to late-1990s, at about the same time as coyotes became well established across the state. In combination with the ongoing high doe harvest, heavy predation by coyotes on fawns was more than most deer populations could sustain, and statewide numbers began to decline. But just as hunter harvest alone was incapable of controlling deer populations, coyotes also seem incapable of doing the job without hunter harvest. Consider that deer remain abundant enough to be a nuisance in many urban and suburban areas around the state where coyotes are present but hunting is not allowed. While that may be bad news for those areas, it is good news for areas with too few deer, because it means that by simply cutting back on doe harvests we can increase most deer populations over time. Recovery may require several years of reduced doe harvest, depending on how far deer numbers have declined, but deer are resilient. Hunters may not be able to control fawn predation directly, but they can control how many does they harvest. Fewer does harvested during fall means more does having fawns the next spring. But can we affect predation? Eliminating coyotes entirely is basically an impossible task, but it stands to reason that removing some coyotes would save some fawns, right? During the last three years of the SRS research, we looked at whether intensive coyote trapping could increase the number of fawns that survived. Each year, trappers took an average of 4.2 coyotes per square mile from three 8,000-acre tracts. The first-year results were promising. The likelihood of a fawn surviving was twice what we had seen prior to trapping. 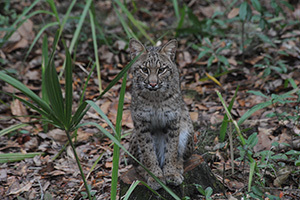 In the second year, however, trapping yielded no benefit whatsoever and in the third-year, survival rates were only slightly better than they had been prior to trapping. How could this be? The trapping program had reduced coyote numbers 70 to 80 percent at the onset of fawning, yet the remaining coyotes were still killing at a very high rate. Perhaps the remaining 20 to 30 percent of the coyote population consisted of older, smarter animals that were the most effective fawn predators. Perhaps a poor soft mast crop (wild fruits such as plum, blackberry and blueberry) during the second year of trapping left those coyotes hungrier than usual. Soft mast actually makes up the bulk of spring and summer coyote diets. Or perhaps immigrant coyotes replenished the population rapidly during the fawning season. The explanation probably involves a combination of all these possibilities. Many questions remain, but it's clear that even intensive trapping does not guarantee more deer. Viewed in this light, the 1.4 coyotes per square mile that South Carolina hunters shoot each year almost certainly has little effect on predation rates. Landowners who can afford the high cost of an intensive trapping program may see a reduction in predation during some years, but few can likely justify the expense, given such uncertainty and marginal long-term returns on the investment. We still have much to learn about coyotes and their effects on deer, not to mention other aspects of their ecology and their adaptations to life in Southeastern ecosystems. Reducing doe harvests where deer numbers are down seems the easiest and most effective remedy. Even where deer remain abundant, hunters and biologists will need to pay much closer attention to deer harvest levels than in the past, as coyotes have become a force that can no longer be ignored in deer management. 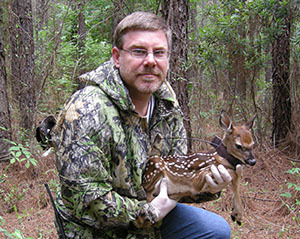 John Kilgo is a USDA Forest Service wildlife biologist at the Savannah River Site in Aiken County. Scientific papers detailing the research described in this article co-authored by Kilgo, DNR wildlife biologist Charles Ruth and others were published in the July 2010, September 2012 and September 2014 issues of The Journal of Wildlife Management.